I touched on the new doors a little while back after we had the front door installed. Our contractor wanted to wait on putting in the back door until most things were done in the basement to make sure it didn't get all banged up. Well, doors and lighting are now installed in the font and back of the house! After months, we also have house numbers!!! 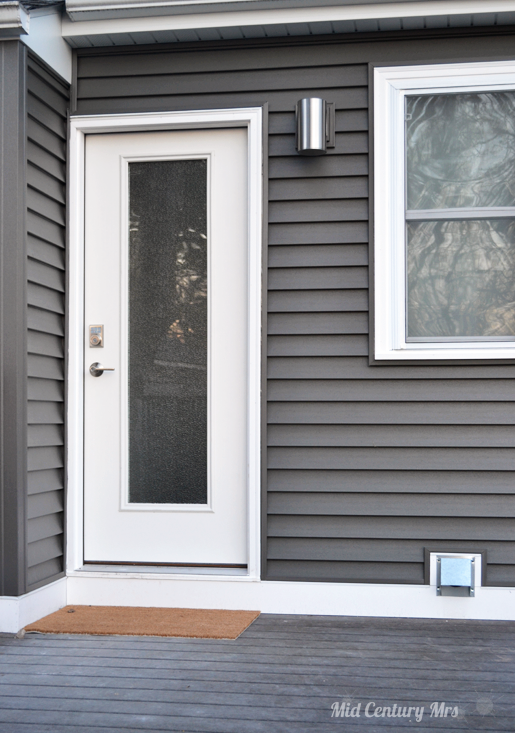 For the front of the house, I was inspired by this customer photo that Crestview Doors shared on their Instagram feed in November 2013. 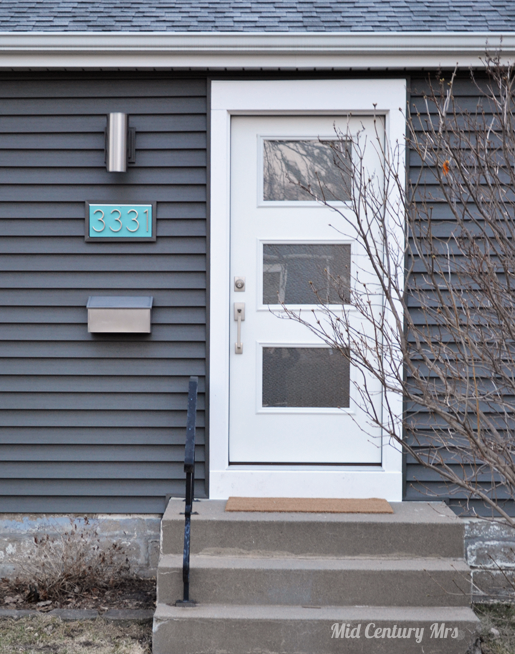 I liked the idea of the house numbers set on something that used the door color. As of now, here is where we are at with the front of the house with the ThermaTru Ari. The door will be painted as soon as its warm enough to do so on a weekend day where we can leave it open long enough to dry. With all of the updates, things are looking really great. At the same time, all the things that we have issues with are really loud... We plan on painting the foundation this spring/summer, so that should help a lot. There is also a matter of the cement steps. The most budget friendly thing to do would be to build over them. If anyone out there has some suggestions or photos of fixes, please let me know. Basically, these steps are disintegrating and have already been patched a few times. It's just not worth it to do it again, plus that shows and it doesn't look great. As of now, here is where we are at the back of the house with the ThermaTru Solei. It is amazing to finally have light back there, since that is the door we use the most. I also plan to paint the back door the same color as the front.